The bags are packed and you are anxiously waiting on your ride to the airport. Time has seemed to fly by and you are wondering if you are ready for this new opportunity. This is either your first time playing football overseas and you do not know what to expect, or you are a returning veteran and you are ready to get the new season underway. Continuing our series of articles on the life of an import in Europe, we will look into playing and living in the country of Germany. The German Football League (GFL) is the elite league of American football in Germany, and to some is consider the best competition played in Europe. The league was formed in 1979 and is divided into two conferences, with each conference consisting of eight teams. 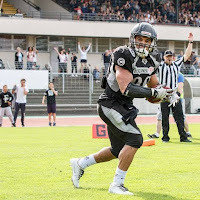 The four best teams from each conference at the end of the season will participate in playoffs to see who will go to the championship game, the German Bowl. Germany has different levels of American football. The American Football Association of Germany (AFVD) is an association that oversees the structure of the German league system. The system has six different levels, with teams in every league being able to achieve promotion or relegation through their final standings’ games. The top level, GFL, and the second level, GFL 2, both have two regional divisions. The third level, Regionalliga (Regional League), is divided into five different leagues. The Oberligas, Verbandsligas, Landesligas and Aufbauligas make up the fourth, fifth, and sixth levels with several leagues in each level. 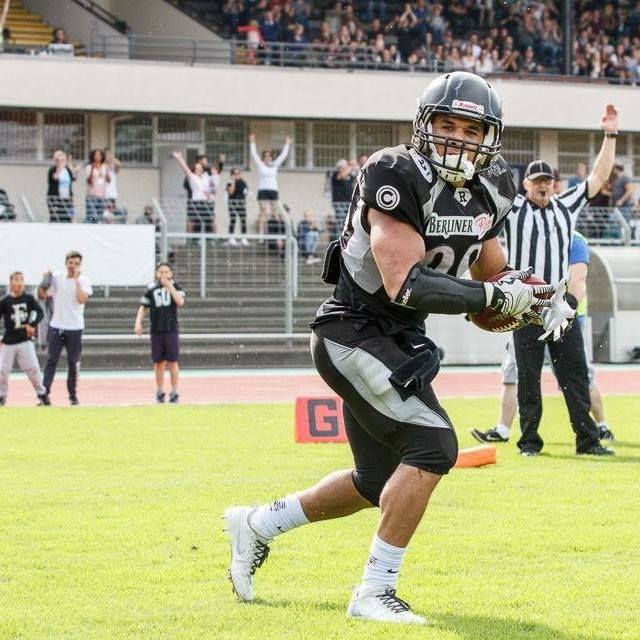 Cedric Townsend of the GFL South Allgäu Comets is not new to the European scene. 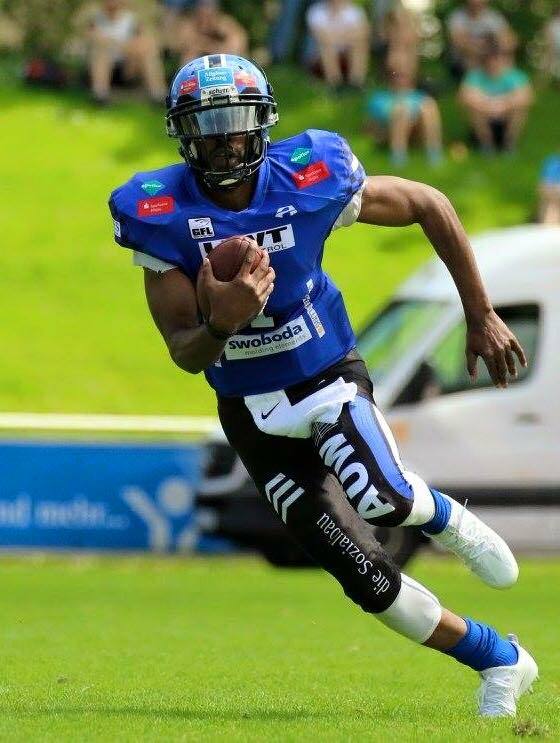 Townsend, the quarterback for the Comets, is well traveled when it comes to playing football in Europe. “Before coming to Germany I had the experience of playing in Europe already, as I was in the Sweden the previous season, so I was already accustomed to how things were. I had heard Germany had the best quality of football in Europe, with a majority of the top teams as well. So I arrived expecting good things and I wasn't disappointed. The speed, commitment, growth, talent, and popularity, was higher than what I was accustomed to.” – Townsend. “A plus for Serbia, in my honest opinion, is they have better athletes. Unfortunately it’s still considered a new sport in Serbia, so they are just missing the same experience and coaching expertise that the Germans possess. Overall, both countries have good football, but its really no true comparison. Germany is where you would want to play to gain exposure and overall team competition.” – Akins. “I enjoy the history in Germany. Growing up in school we learned a lot of things in the past involving Germany and its cool to be able to visit or see some of the things you learned about as a kid. The traditions, like Lederhosen and Oktoberfest, are fun to experience as well as special customs different areas have.” – Townsend. “I enjoy Germany. The people here have been kind, and welcoming. Many speak great English so it has been a smooth transition. I'm usually in the states during the winter months, so I get the best weather Berlin has to offer. The thing I like most about this city (Berlin), is the abundance of cultures that either live or visit on any given day.” – McCoy. “When arriving to Germany, there were many different cultural differences I noticed. The language was the main thing. It was just unusual to hear people mainly speak German, especially when my whole life the main language I have heard is English. Another cultural difference I noticed is in the summer it doesn't get dark out until 10 PM, which I thought was amazing. I've noticed that living in Albershausen there is a lot of farmland with people riding tractor-trailers around the streets. Coming from Philadelphia, I thought that was very unusual, especially seeing a city type of living my whole life.” – Conroy. “I like the fact that Germany is really Americanized. It makes me feel a lot more comfortable because it almost feels as if I am back home in the USA. The town I live in, Rothenburg ob der Tauber, has a ton of history that really caught my attention when I arrived. They are really big on tradition in my town, food and beer being some of the few things that stand out. The people in Germany pretty much understand English really well so asking for help is never a problem and someone is always willing to point you in the right direction.” – Akins. “Personally I've been over here for so long I kind of feel more like a foreigner in the US. But obviously the beer is amazing in Germany, and the people are all so nice and are willing to be patient with my poor German skills. Living here is amazing; I mean it's so hard to complain about anything when I’m playing football for my job. I'm truly so blessed.” – Robinson. “The Berlin Rebels have taken good care of me. They have a good combination between management and coaches. The organization has made Berlin feel like a second home for me, and that's greatly appreciated. Especially being so far from home.” – McCoy (Berlin Rebels, GFL). “To be 100 percent honest Frankfurt is top notch! From the president, to the fans, to the coaching staff, and to the lovely ladies who help us out on game days, I can't say enough about them. They really do take care of you here.” – Robinson (Frankfurt Universe, GFL). “I've been fortunate with the places I have been. They have all been good organizations and people involved with it. They have seemed to be more interested in me as a person than as a football player. That’s nice to have. With that being the basis I have been able to connect with good/die hard fans as well.” – Townsend (Allgäu Comets, GFL). “My team’s organization has treated me really well. Everything that was in my contract has been honored accordingly. If I have a concern about anything they help to solve the issue or take care of it in a quick manor. I can only speak highly of the organization because my experience with them has been great!” – Akins (Franken Knights, GFL 2). “This organization has been nothing but great to me since I arrived here in February. Everyone on the team was very welcoming and friendly. They've taken care of me and made me feel comfortable being in another country. Whenever I need something or someone, they have always been there for me.” – Conroy (Albershausen Crusaders, Regionalliga). Thank you to those who interviewed for this article. Your comments and insight will help to grow the knowledge of American football played in Germany. Currently, the GFL is awaiting the German Bowl XXXVIII that will be played on Saturday October 8 in Berlin. The Braunschweig New Yorker Lions (North Division) will look to defend their title against the Schwäbisch Hall Unicorns (South Division). Unfortunately Lawrence McCoy and the Berlin Rebels lost their first round match-up against the Schwäbisch Hall Unicorns (24-14). George Robinson and the Frankfurt Universe lost a close first round battle to the Kiel Baltic Hurricanes (10-3). 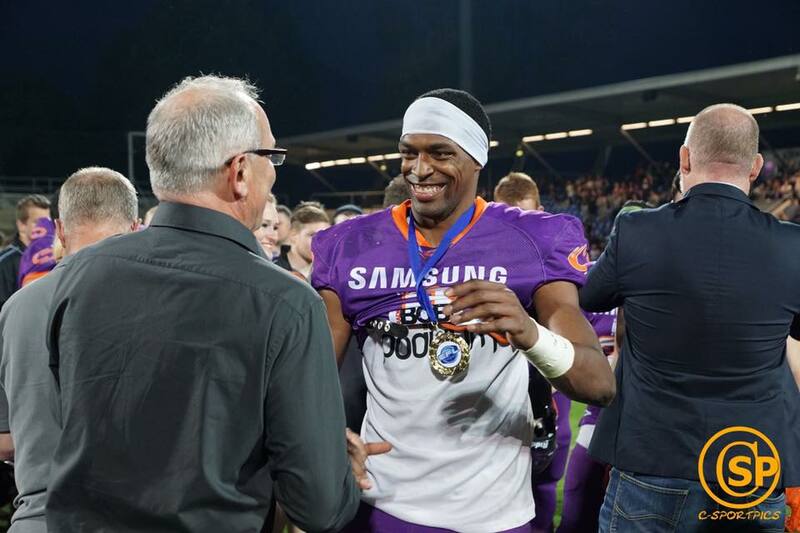 Cedric Townsend and the Allgäu Comets had the same fate as the rest of our imports interviewed, losing in the first round, to the New Yorker Lions (30-6). In the GFL 2, the Ingolstadt Dukes (South Division) and the Cologne Crocodiles (North Division) look to move up a level, as they get ready for their second playoffs this upcoming weekend, October 1-2. Both the Crocodiles and Dukes have a commanding points advantage against their opponents. David Akins and his Franken Knights did not make the playoffs this season. Matt Conroy is the only import interviewed that is still battling in the playoffs. 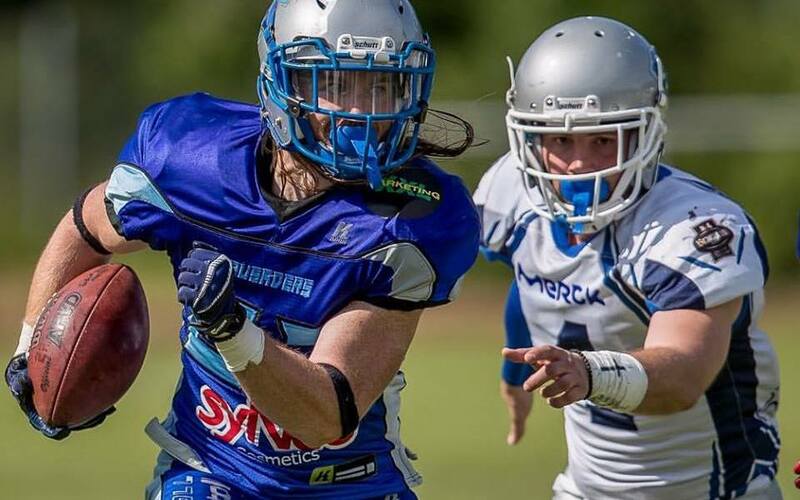 Conroy and the Albershausen Crusaders get ready for their second playoff match against the Straubing Spiders this Sunday October 2, to see who will move up a level. The Crusaders have a 46-point advantage after winning their first game 60-14. Please check out Touchdown Europe’s Facebook, Twitter and Instagram for all your European American football up to date information.